Carine Roitfeld, former editor of Vogue Paris, is one of the most respected women in fashion and beauty. 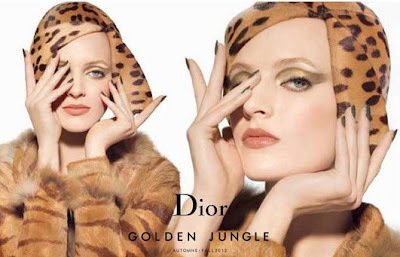 She applied her uncanny abilities to create a stunning collection for Fall 2012, Dior's Golden Jungle Color Collection, which has started to arrive in stores. The collection features Daria Strokous posed in a Fall 2008 couture leopard print hat and captivating neutral makeup captured by world-famous photographer Steven Meisel. I love leopard prints - as long as no leopards were harmed to create them - and think the photos are appealing. Dior's Golden Jungle Essentials for Radiant Eyes and Lips ($70) in #002, Golden Browns, is the centerpiece of a the collection. It reached out and grabbed me as I strolled through Neiman Marcus looking for new makeup. Any cat would. To protect the lip gloss, the silver compact has a door. It's flipped up in the photo above and down in the photo immediately below. That's a nice touch we've seen before from Dior. I like it for travel anywhere away from the bathroom counter. The panther print eye shadow includes shades of black, brown, and shimmering gold. Because of the design and size of the individual colors, I find it almost impossible to use all three shades individually. I'm impatient when I apply eye shadow. I don't want to meticulously use three different brushes to "get the look." My swatch photos show how I'll use the panther shadows. The swatch at the top of my arm shows all three shades blended together. Because of the lighting, it shows in these photos as medium brown, but you can make the blended shade a copper brown if you use more gold in the blend. I tried to use all three colors evenly. The middle shade on my arm is the golden shade alone. As you can see, it's very light. It's a perfect base shade and can be used as a non-shiny highlighter. Dior's photo at the top of this feature shows an artistic mixture of the eye shades. I think it's spectacular. Just be ready to work a bit with the colors to achieve that look. The lip gloss is an extremely pretty, shimmering light peach - a perfect shade to coordinate with the neutral eye shades. While it doesn't add a lot of drama to the lips, you won't want that when you've made your eyes the center of attention. I purchased my Golden Jungle palette at Neiman Marcus, where the pieces in the collection - most pre-ordered - were selling out this weekend, and they just arrived. For some reason, the Dior collections sell out the fastest. I'm glad I was able to get what I wanted. I've got more to show you: two gorgeous palettes and a me-color lipstick. Stay tuned and pray for sunshine, please. I'll put a Mom update in the comments. Thank you, everyone, for your concern. Thank you for all your comments about Mom. She is no better, no worse. She remains very weak and confused. I hope today brings some improvement since she will have been off Vitamin D since Wednesday. I even cut back on the calcium over the weekend (went rogue, had no physician instructions to try that, but it made sense to me since her blood calcium is high). We had two caregivers there last night. It's too early in the morning to get a report, and I have to go to work. More later. My thoughts and prayers are with you and your mom. I hope she begins to improve soon. I can't imagine how stressful dealing with all this is for you, and I am wishing you strength and peace. I purchased this in Toronto last week and adore it! I also got one of their 5 colouers palettes in khaki design and the vernis nail duo, which really intrigues me because it's supposed to create a 'crocodile' effect. I decided to pass on this particular palette but now I'm rethinking that...it looks great in your swatch photos! ANd I LOVE that gloss! Thanks, Meredith! I got Khaki too. I've just had no sunshine to get photos. Take a look at it in the store, if you can. CG - I'm glad to read that your Mom is sharper this afternoon when you saw her. I watched my mom work with her Mother as she aged. I know what a huge job it can be & how mentally, emotionally & physically draining it can be. Not to sound flip but in the midst of heinous national & local news, the stress of caring for loved ones, the difficulties of work & personal medical issues I am glad that I have diversions like this blog & others where I can escape, even if just for a few minutes to recharge & get ready to face it all again tomorrow! Hugs CG!